January 17, 2018 – Started by the Space Foundation in 2004, the Teacher Liaison program influences space and science education at an international level. 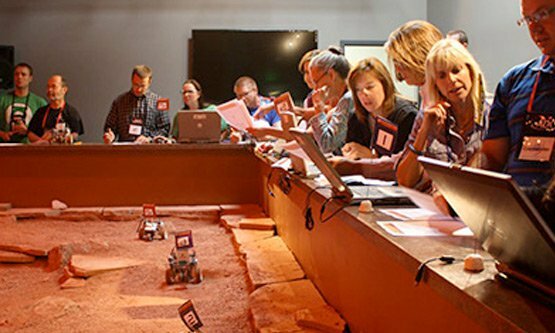 Teacher Liaisons serve as advocates for space-themed education, and use Space Foundation-provided training and resources to further integrate space principles into the classroom. The Space Foundation has selected 31 outstanding educators to join its Teacher Liaison program in 2018, including six international applicants from India and Nigeria. The educators were chosen for their active promotion of space and science education in the classroom. A new flight of Teacher Liaisons is selected every January. The program is open to public, private and homeschool teachers, as well as school administrators, principals, specialists, curriculum and instruction developers and others who deliver education programs to students. New Teacher Liaisons are selected by a panel comprised of experienced Teacher Liaisons and representatives from the space industry and the military. The Space Foundation Teacher Liaison program is funded by Lockheed Martin. The new Teacher Liaisons will be publicly recognized at the Space Foundation’s 34th Space Symposium, which is being held April 16-19 at The Broadmoor Hotel in Colorado Springs, Colorado. In addition to the recognition activities, Teacher Liaisons also participate in the Space Foundation’s virtual distance delivery education programs.